Since 2006, Project Ploughshares has worked with the policy branch of the Canadian International Development Agency (CIDA) on a joint project to address the urgent need for linking official development assistance (ODA) programs with armed violence prevention and reduction and, more specifically, with the control and reduction of small arms and light weapons (SALW). The project is intended to provide CIDA with policy guidance on the challenge of integrating armed violence/small arms reduction with sustainable development. It has involved several components—papers, workshops, interviews, and international seminars—and has drawn on the growing, if still nascent, body of policy research and analysis related to the small arms/development nexus. This paper provides a summary of the recognized linkages between armed violence, small arms, and development as well as the multilateral and national policy landscape related to the integration and mutual resolution of these issues. The paper notes that the small arms/development link could represent an important point of application for Canada’s Whole of Government approach to foreign policy. 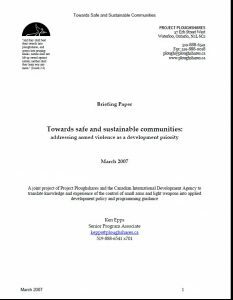 Consequently, the paper explores the role CIDA might play within this collaborative approach by integrating armed violence and SALW control and reduction with its development program.